Kouvola is a town and municipality in southeastern Finland. On the 15th (Thu), see the interesting displays at Kouvola City Museum, take a peaceful walk through Niivermaki Nature Conservation Area, then stroll through Hiidenvuori, and finally identify plant and animal life at Arboretum Mustila. On your second day here, trek along Santalahti Nature Trail, tour the pleasant surroundings at Varissaari - Fort Elisabeth, and then identify plant and animal life at Riverside Park. To see maps, where to stay, ratings, and more tourist information, read Kouvola itinerary builder website . Melbourne, Australia to Kouvola is an approximately 25-hour flight. You'll gain 8 hours traveling from Melbourne to Kouvola due to the time zone difference. When traveling from Melbourne in October, plan for much colder days in Kouvola, with highs around 7°C, while nights are a bit cooler with lows around 1°C. Finish your sightseeing early on the 16th (Fri) so you can travel to Koli National Park. Kick off your visit on the 17th (Sat): identify plant and animal life at Patvinsuon Kansallispuisto. Keep things going the next day: stop by Koli Shop Retkitupa, tour the pleasant surroundings at Akka-Koli Hill, and then trek along Paha-Koli Hill. To see photos, where to stay, reviews, and other tourist information, use the Koli National Park itinerary planner . You can drive from Kouvola to Koli National Park in 5 hours. October in Koli National Park sees daily highs of 6°C and lows of 0°C at night. Wrap up your sightseeing on the 18th (Sun) early enough to travel to Kuusamo. Kuusamo is a town and municipality in Finland. On the 19th (Mon), explore the world behind art at Hannu Hautala Nature Photography Centre, explore the stunning scenery at Kiutakongas Rapids, and then hike along Pieni Karhunkierros Trail. On the 20th (Tue), you'll have a packed day of sightseeing: explore and take pictures at Palosaari Reindeer and Fishing Farm, then see exotic creatures in open habitats at a safari tour, and then stop by Shopping Center Kumpare. 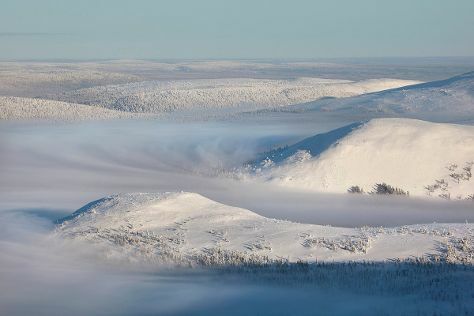 To find where to stay, photos, and more tourist information, go to the Kuusamo tour planner. Getting from Koli National Park to Kuusamo by car takes about 5 hours. Other options: fly. While traveling from Koli National Park, expect a bit cooler days and about the same nights in Kuusamo, ranging from highs of 3°C to lows of -1°C. Finish your sightseeing early on the 20th (Tue) to allow enough time to travel to Muonio. Muonio is a municipality of Finland.The town is located in far northern Finland above the Arctic Circle on the country's western border, within the area of the former Lappi province. Step out of the city life by going to Pallas-Yllastunturi National Park and Keimiotunturi Fell. You'll discover tucked-away gems like Torassieppi Reindeer Farm & Cottages and Scandinavian Adventures. Step out of Muonio with an excursion to Seven Fells Up in Akaslompolo--about 46 minutes away. There's more to do: see the interesting displays at Muonion Kotiseutumuseo. To find reviews, where to stay, and other tourist information, go to the Muonio online trip itinerary maker . You can drive from Kuusamo to Muonio in 5.5 hours. In October, plan for daily highs up to 1°C, and evening lows to -3°C. Wrap up your sightseeing on the 23rd (Fri) to allow time to travel to Inari. Start off your visit on the 24th (Sat): see the interesting displays at Siida, explore and take pictures at Inari Reindeerfarm, and then get a dose of the wild on a nature and wildlife tour. Get ready for a full day of sightseeing on the next day: explore the striking landscape of Lemmenjoki National Park. To find maps, other places to visit, where to stay, and tourist information, use the Inari online tour planner . Drive from Muonio to Inari in 3.5 hours. In October, daytime highs in Inari are 3°C, while nighttime lows are -2°C. Wrap up your sightseeing on the 25th (Sun) early enough to travel to Kimito Island. Start off your visit on the 26th (Mon): explore the world behind art at Soderlangvik and then stroll through Oro. Keep things going the next day: enjoy the sea views from Archipelago National Park. To see more things to do, ratings, and other tourist information, use the Kimito Island day trip planner . You can do a combination of flight, train, and bus from Inari to Kimito Island in 8 hours. Other options are to do a combination of flight and bus; or drive. Traveling from Inari in October, expect Kimito Island to be a bit warmer, temps between 10°C and 1°C. Finish your sightseeing early on the 27th (Tue) so you can drive to Helsinki. 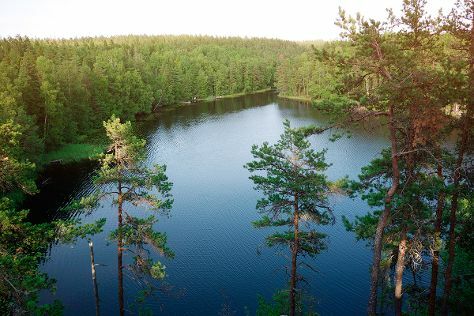 Step out of the city life by going to Nuuksio National Park and Ekenas Archipelago National Park. Explore hidden gems such as Room Escape Games and Hakaniemi Market. There's more to do: contemplate the long history of Seurasaari Island and Open-Air Museum and stop by TeeMaa Tea House. To find where to stay, maps, reviews, and more tourist information, read our Helsinki online trip builder . Getting from Kimito Island to Helsinki by car takes about 2.5 hours. Other options: do a combination of bus and train; or take a bus. In October, daily temperatures in Helsinki can reach 10°C, while at night they dip to 1°C. Finish your sightseeing early on the 30th (Fri) so you can travel back home.